Summary and Definition: The Erdman Act was passed in 1898 and sponsored by Constantine Jacob Erdman (1846 – 1911), a lawyer and a Democratic member of the U.S. House of Representatives from Pennsylvania who the law is named for. The Erdman Act was a Railway Labor Act that set up arbitration procedures through the policy of mediation and conciliation to settle railway disputes. 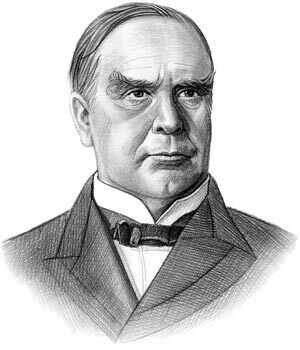 William McKinley was the 25th American President who served in office from March 4, 1897 to September 14, 1901. One of the important events during his presidency was the passage of the Erdman Act. The Erdman Act of 1898 was passed in the wake of industrial disputes involving the railroad workers. The events of the Pullman Strike that occured in 1894 were still in the minds of the politicians and the general public. The Pullman strike had started in Chicago and spread right across the country involving over 100,000 employees working on 24 different railroads. The strike had turned violent and President Cleveland was forced to send in US troops to quell the riots. The military used harsh methods to suppress the strikers resulting in deaths, serious injuries and hundreds of arrests. Railroad workers were granted more rights under the provisions of the 1916 Adamson Act in 1916 that shortened the working day from 10 hours to 8 hours at the same rate of pay. For additional facts refer to the History of Labor Unions. The article on the Erdman Act provides detailed facts and a summary of one of the important events during his presidential term in office. The following William McKinley video will give you additional important facts and dates about the political events experienced by the 25th American President whose presidency spanned from March 4, 1897 to September 14, 1901.